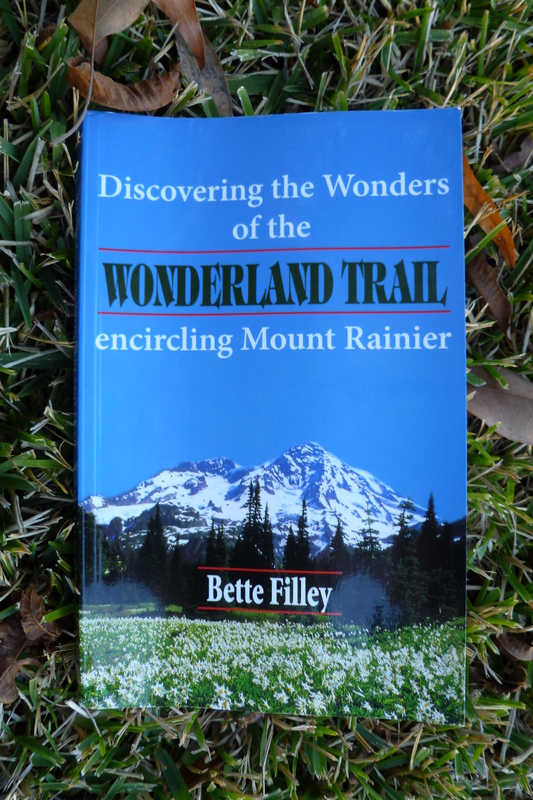 Bette originally wrote the book in 1969, 4 short years after completing her first thru-hike of the trail. At this point, the book was accepted to publication, but never made it into print. At least not until quite a few years later, at which time the book was updated and finally put into print! The book is divided into 2 sections. The first section is all about the area. The mountain itself, the glaciers, wildlife, forests, weather and of course its history. She also gives general advice on backpacking in this area. What is really nice is that she has also included suggested itineraries for a complete WT thru-hike, as well as even just weekend and single day hiking adventures. The second half is simply a hiking log. Like the other great guides, she includes it all from one point to the next point: mileage, elevation gain/loss, explanation of the trail in this area, distances to other trails and campsites, etc… and of course water sources. She also includes hand-drawn maps and even includes the hang-outs of some animals such as bears and goats. So, I am excited about the book. This is my first step of the trip; granted it is not on the actual trail (not to mention the trail is about 2 thousand miles from where I now sit typing this up as well as nearly 2 years away) but it is a step in in the direction of preparation for the trail. The next step I plan to take will be the map, which will be the Green Trail Map # 269S: Mt Rainier Wonderland. The ultimate Mount Rainier Map! Printed on a waterproof/tear resistant sheet. Side A Features the entire park at a scale of 1:63,360. Side B contains a 1:24,0000 climbing map with details and GPS waypoints of the most popular routes up the Mountain and a Wonderland Trail Profile. Bummer about the permits, but cool you could still explore the NW! I’m hoping to do the WT this year…permit allowing. Yeah, I was still excited, and it turned out to be a very memorable trip! Really enjoyed it. Anyway, good luck with your permits, and your hike! Hi, just curious if you ever made this trip, and how it went if so! 7 Days & 6 Nights in the Olympics! A buddy and I made our first attempt at the WT this past summer. We are both new to backpacking and our trip did not go as well as planned. There were two major mistakes that were made. One in the planning of our trip, and the other was the weight of our packs. The planning error was due to the time of year that we decided to go. To accomodate others’ plans (who later canceled on us two weeks before the trip), we decided to head our on July 20th. We soon found out that it was about 3-4 weeks too early. We were starting from the eastside at Sunrise and working our way clockwise around the mountain. Most of the eastside was covered in snow! The incredible weight of our packs (50+ lbs) didn’t make it any easier. To make an already long story shorter, my right heel and toes were heavily blistered, my shoulders and legs were sore, we thought that my buddy had torn a ligament in his knee (turned out to be strained due to pack weight), and we had to cut our trip short after three days. Neither one of us were discouraged and we used it as a learning opportunity. We are fortunate to live about 3 hours away from Mt Rainier, so we didn’t have far to go, and we learned a lot in those three days. I have lightened my pack from that 50+ lbs to 20 lbs on the last weekend trip in Sept. I also purchased a kit to make a G4 backpack that should weigh in at around 12-16oz. We are going to try again next year in late August or September. I enjoy your blog and videos. Keep em coming! Hi, thanks for stopping by and commenting. Anyway, we are planning to also hike the WT hopefully next September, but at this moment have not made definite plans…but maybe we will see you on the trail! Good luck on your upcoming trips! I’ve seen your comments around on BPL, etc. Good stuff. When are you planning on doing the Wonderland? I’ve got my request in for August 5-10. Fortunately for me, I’m only an hour and a half from the trail! Anyway, thanks for stopping by and good luck on your hike! Wow, I’d never heard of the Wonderland Trail until now. I’m currently living in Annapolis and have gotten into backpacking within the last year (being slowly buying all of my own equipment and doing a few trips on the AT), but now you’ve got it in my head that when I go home this summer to Las Vegas, I should fly up to WA and hike it. I have friends and family up near there, so I have multiple reasons to go. When are you planning on doing it? Anyways, I’ve been enjoying your blog! Keep it up, and good luck with your future AT hike! I plan on doing the PCT eventually but won’t be able to in full for at least another seven years or so. Thanks for checking out my blog and glad to hear that it turned you onto another trail! If you end up heading up there let me know how it goes. I also wouldn’t mind getting out on the PCT sometime…and to thru hike it would be awesome! Good luck with those plans and maybe one day I will see you out there on the trail. I actually did Mowich clockwise in 11 days in 2010 – awesome trip! I was looking at your gear list, and 2 things you can toss right away are the bear line and biner – there are bear poles at every campsite along the WT, which you *must* use – the park does not permit you to hang a bear line/bag. Soo….less weight! Awesome! Thanks for the info. I appreciate it! Sounds like you have a great plan started here. We started our plan about 9 months ago and we, my son, grandson and I, are planning the hike in August 2011 starting at Longmire for 13 days, doing several of the sides trails too. It was interesting to see you are doing the same things we did to start the plan. Betty Filley’s book and the map! The gear list could be identical except for brand names. We are planing on 20-25 # of pack weight plus carry on person items. I am as excited as you seem to be, and have been for some time. I hear you when you say, each time you pick up the book or map, you start thinking hike. Us too. Good luck!